(Grade: 4) by The Critical Thinking Co.™ and today we’re sharing our review of this great workbook with you. We’ve used software programs by Critical Thinking Co.™ before (you can read about our experience with Math Analogies Beginning software.) and had success with them so I was very interested to see what they had to offer for older children. 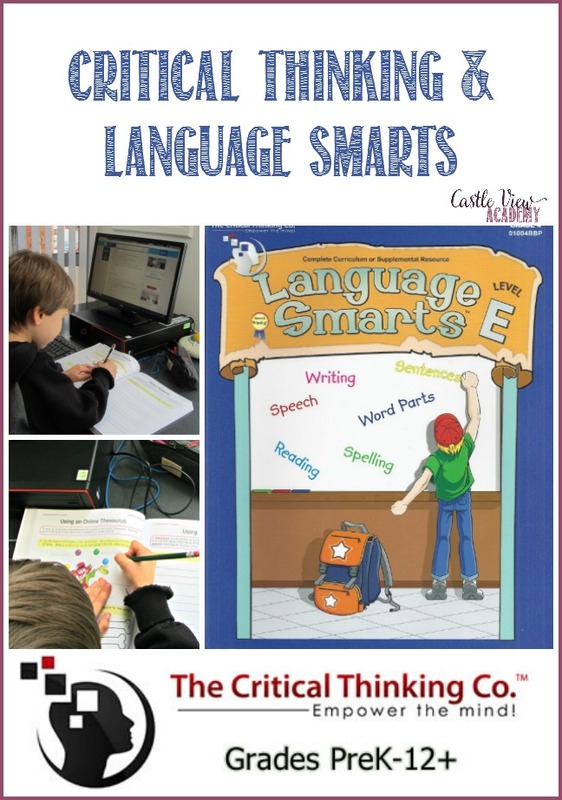 Language Smarts Level E is brand new in their Language Smarts series. We received a physical book (it’s also available as an ebook). It’s a hefty 392 pages! So we really feel like we’re getting our value’s worth (it currently retails at $42.99). One reason I love using physical products over computer-based products are that both parent and child can see the progress being made, a physical book can be taken with you to use wherever you may be (Tristan worked on this at the end of a conference table while I was in a meeting at the University), and physical books allow for more interaction between children and their teachers/parents. This book may be used as either a complete curriculum or as a supplemental resource. It definitely doesn’t leave much out. It states that it’s aimed at grade 4, but also has elements in it that go into grade 5 to stretch children’s minds and prepare them for the next level. I wasn’t entirely sure Tristan would be ready yet as he’s in the third grade, but after looking at the handy sample pages that you can preview on their site I was confident that he would be able to get a good start into this book and it would challenge him to learn more. What does Language Smarts Level E contain? Each lesson starts with a boxed-out section that explains the concept for the day before moving on to the assignment. Often there is a fun activity such as a word search or cross word in which you find the answers from the previous page. There are fill-in-the-blanks, and writing new sentences based on target words. Tristan worked on completing between 6 and 10 pages a week, depending on what other things we had going on. Each lesson is about 2 pages long which makes them a good length for children of that age; long enough to learn, but not so long that they’ll be scared of them or get bored. The brilliant thing about this book is that you don’t have to work through it in order, you can skip around depending on what your student needs to learn. 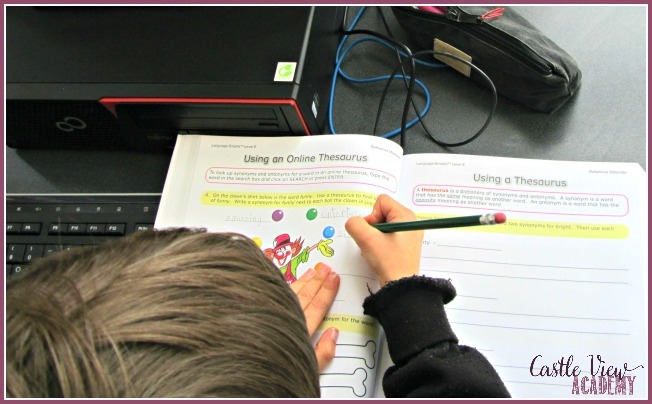 Tristan started at the beginning and worked through syllables, prefixes, suffixes, synonyms, and antonyms before moving about a little to explore other areas of the curriculum such as pronouns, verbs, using a dictionary and thesaurus. 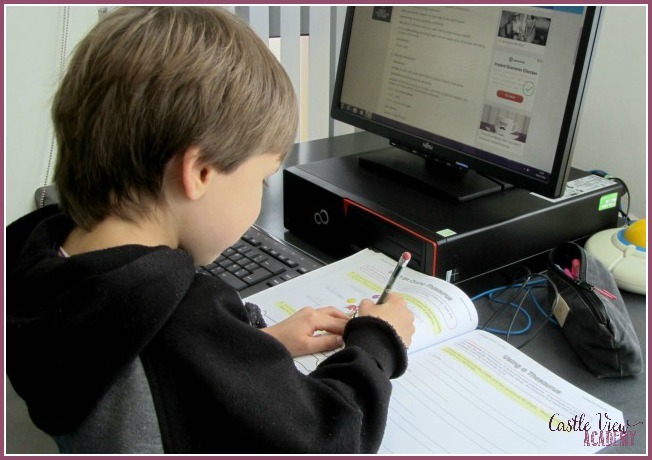 Tristan is really loving using reference books – he now uses the online Oxford dictionary with confidence, and he actually did fist-pump in the library last week when he scouted out a thesaurus he could borrow to use at home! Really – is this my kid? I will admit (and Tristan will, too) that at times he did find some of the work a little too challenging but that was mostly up to him thinking he couldn’t do it. Once he sat down and opened his mind he did very well and had almost all of the answers correct! There are areas that he’s not yet ready to do such as the writing elements near the end of the book; but those are where the book transitions into grade 5 so I wouldn’t expect him to be ready for those yet. But they are there and waiting for the time he needs them in a year or two. There were a couple of concepts we’ve run across that needed a little extra explanation so we used another language arts book to review it and then Tristan was confident and ready to continue. Will we continue with Critical Thinking? It would take an entire year to work through Language Smarts Level E doing 2 pages a day! Will we do it? How will we continue to use this book? Yes, we’re definitely going to continue using this curriculum. Because it is a little above Tristan’s current grade but he is doing well with it my plan is to alternate this workbook with another program we have that is heavy on details and explanations. I think they will complement each other very well and break things up for Tristan for a little variety. Doing this he’ll complete both excellent programs by the end of grade four and have a thorough understanding of English grammar….putting his parents to shame, I’m sure. Language Smarts Level E is a wonderful resource to have whether it’s to learn new grammar skills, or used as a refresher for older children (and quite possibly adults as well). From what I have seen from Tristan using it as well as my own browsing through and exploring further contents, this would also be a good book for ESL students both in English-speaking countries or their own. Well done Critical Thinking Co.™ I know we’ll be back again to purchase more of your programs! To read more reviews about The Critical Thinking Co.™ by the Homeschool Review Crew, click on the graphic below and follow the instructions. You will find 85 honest reviews by the Crew on this book, as well as other books and pre-k to grade 2 software programs. If you’d like to know more or would like to follow The Critical Thinking Co.™, you can connect with them through their website, Facebook, Pinterest, and Google+. This sounds similar in many ways to a gifted ed curriculum I taught. This will be a wonderful study for your children. Thank you for this informative article.